“Don’t get lost,” “have a schedule,” and “manage your time well”—these are some things that we use to hear often. Yet some of us have difficulty in keeping these in mind! Fret not! We offer an amazing collection itinerary templates to help you organize and plan special events or even as simple as a day trip to the beach. These will surely help you in time management, proper scheduling, and thus, not getting lost in the busyness of the day and the tightness of its hours. An itinerary is defined as the route of a journey or tour and the proposed outline of one. By its definition alone, you can see how important it is. Failing in having an itinerary or not being able to follow it, you can have a devastating—not to say embarrassing—experience, not only for you but for your family, friends, or work colleagues. Having and sticking to an itinerary can be a rich and self-fulfilling experience. That said, our impressive assortment of itinerary templates will kick-start your itinerary-making prowess. Our wide selection of templates will help you envision steps to take in creating and fulfilling the perfect time management, scheduling, and places to go. Be it a formal business event, a holiday escapade, or a familial vacation, these templates can cater to your every need accordingly. You can download them for free, edit or add items to your heart’s content, and print them just as easily! 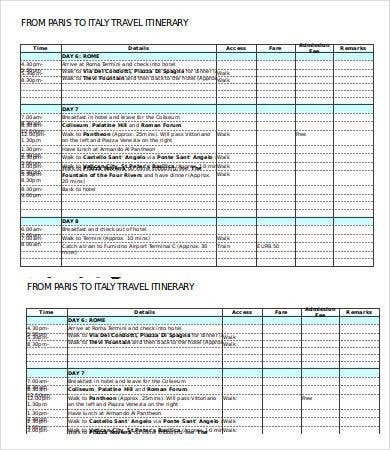 For those planning their vacations, our trip itinerary templates give you a comprehensive list of important things such as transportation, accommodations, addresses, times, and we even added a blank space for your other notes or details. 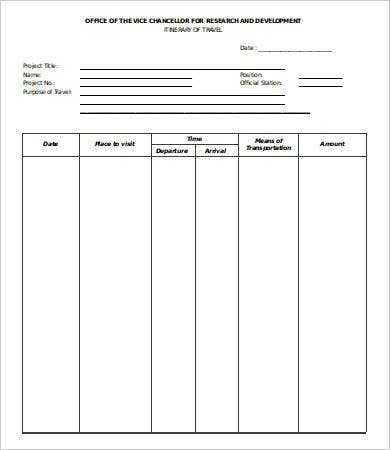 Our meeting itinerary templates will help you create a general outline to help you stay focused and on track in team meetings, executive meetings, or sales meetings. Planning events has become a daunting task as society becomes more rapidly eventful. But we can make your event planning a light and precise task. Our event itinerary templates can help you in this regard. We offer our event itinerary templates as a tool for you to prepare well with all required information, forgetting not even the smallest details. As it is in Excel format, you can ensure to keep track of the things to do, where and when to do it, down to minute things that are easily forgotten. Because our event itinerary template is comprehensive, you are ensured not to miss a thing, sparing you unnecessary effort and useless anxiety. Given that our format is in Excel, you can customize your own. Download our templates and personalize them by highlighting the more important information through the variety of colors in Excel’s formatting style. In this way, you can be an efficient time manager, effective event planner, and precise task tracker.